We have often used the example of Google Earth to explain the idea of first mapping the organizational terrain (via the HR-LDAP hierarchy data), then overlaying additional detail as layers of information that could be switched on and off. In the case of OrgScope, layers can not only overlay the base formal network with myriad working networks, but also expand the underlying framework of nodes itself (e.g., adding contractors, or suppliers and customers). 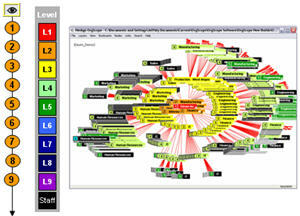 In practice, the organization maintains and periodically updates the base people-position hierarchy, along with some general layers, such as matrix reports. 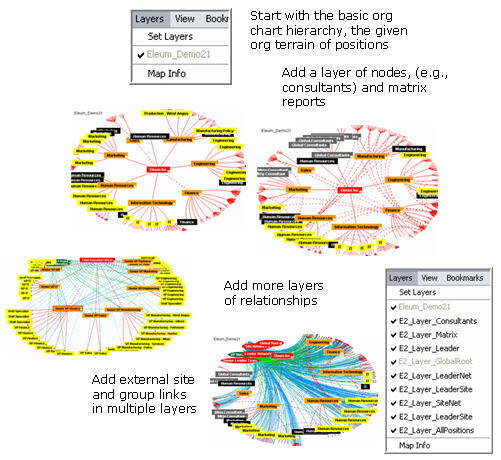 Most layers, however, will be developed by sub-organizations, teams, and specialists working with specific networks threading through and around the formal positions, keeping their own data to overlay on the refreshed hierarchy.